This awesome world war I fighter planet model, namely Eddie Rickenbacker's Spad S.XIII was recently shared by flickr.com user Daniel Siskind, who is also the owner of Brickmania (where tons of different custom creation including this one are for sale). The shaping and coloring of the vehicle is awesome and historically accurate for a minifigure-scale LEGO creation. The decals/stickers are also very nice. 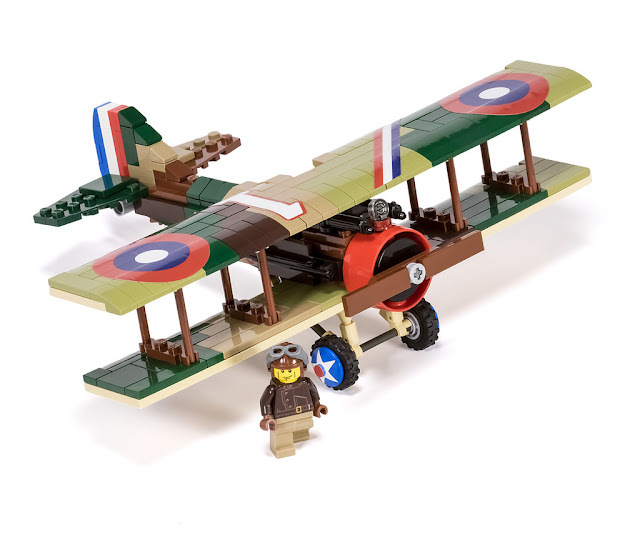 The builder also shared a beautiful air-battle action photo scene in his photo-stream where this plane attacks a German Fokker Dr.1 from behind and bricks fall of the damaged plane.